I see them now and again. 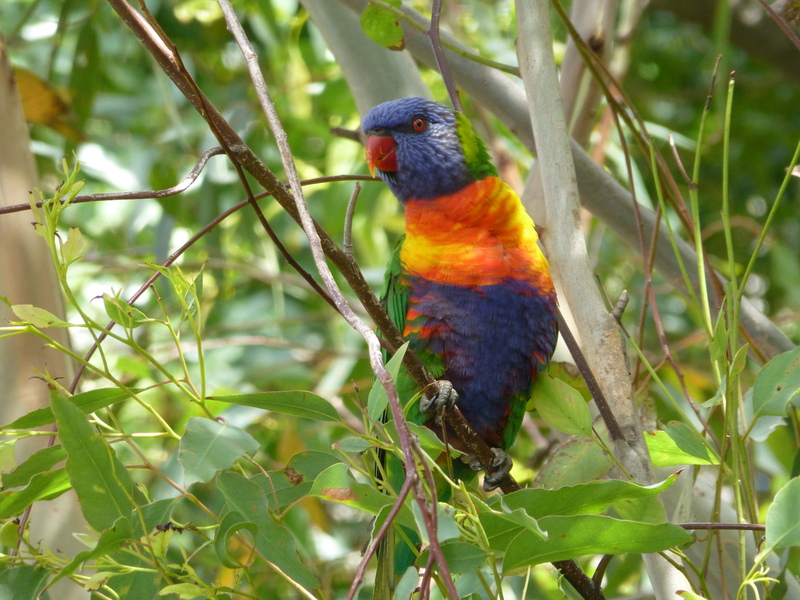 They are less common the Rainbow Lorikeets, but arguably, equally beautiful. 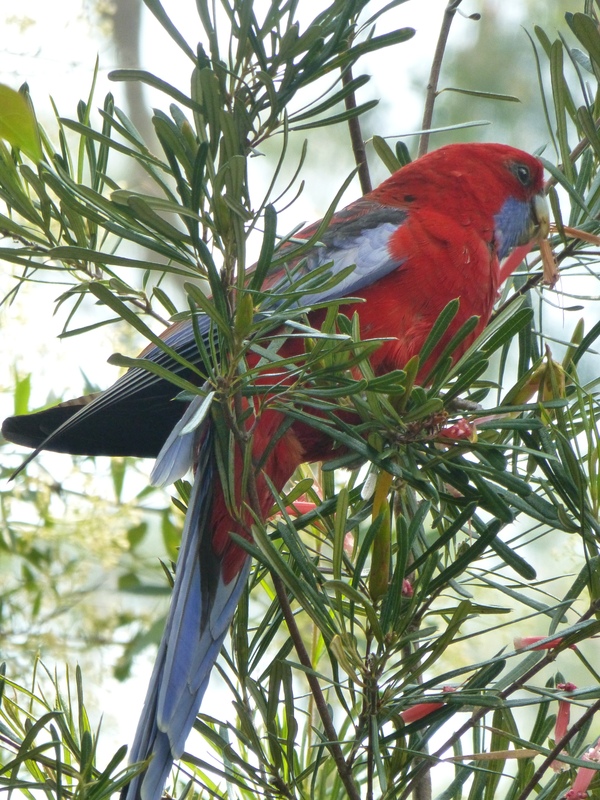 Crimson Rosellas are sometimes seen on the ground, but more often perched in trees or shrubs. They are very agile in flight, too. Here’s a photo of one as he (or she) finds something tasty to eat. With space on this blog running low, I’ve started another. Here’s the link. I’ll still be posting here, as well as at the new one, while I can! 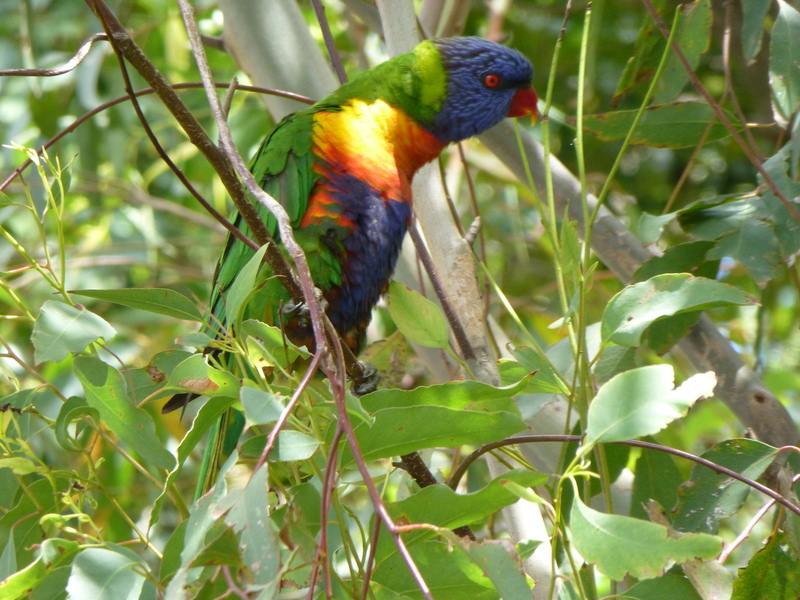 Australia has been fittingly described as the Land of Parrots. From cockatoos in white or black to Lorikeets and budgerigars: we have some extraordinarily engaging types. 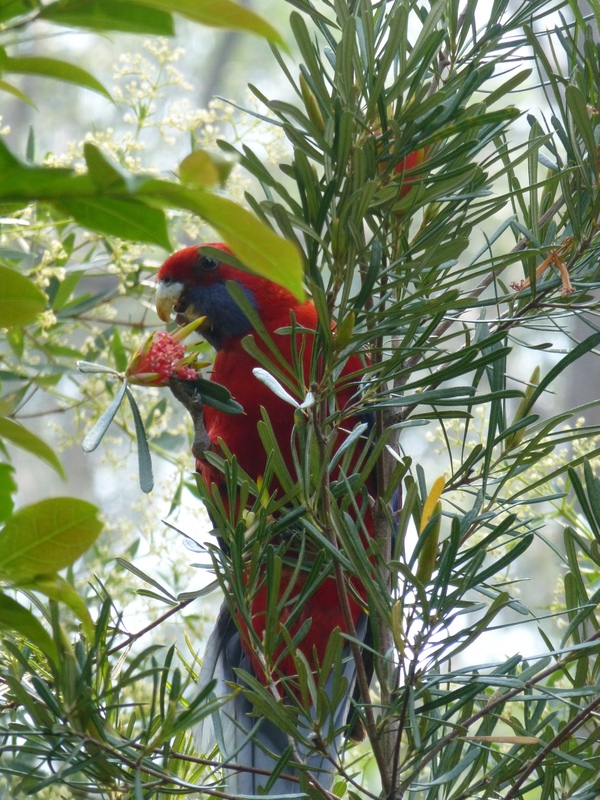 Here’s a photograph I took of a Crimson Rosella as he was gathering nectar at the local park. 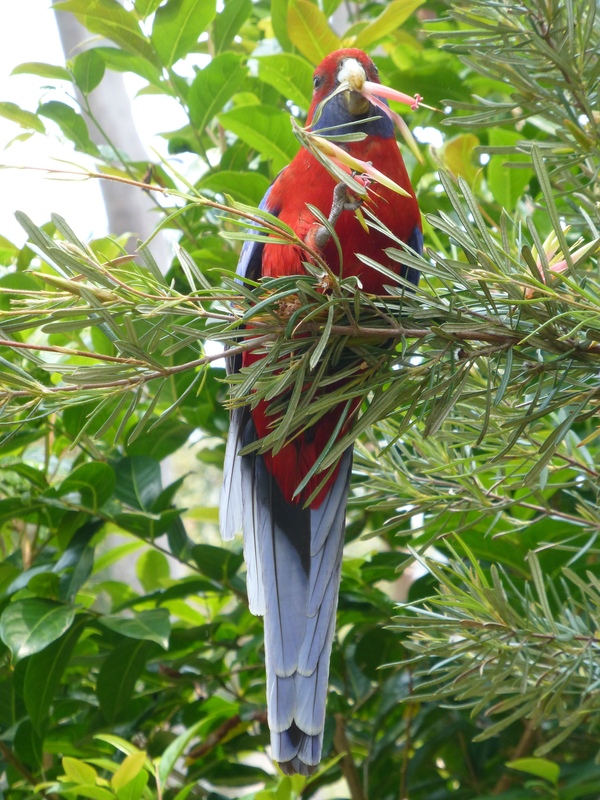 These parrots so often compete with the Cockatoos for the best nesting sites. Maybe there is something around that needs to be watched. This beautifully-feathered Rainbow Lorikeet has ample opportunity to admire the scenery and ponder his next action. Enjoy this glimpse at the life of a wild Australian parrot! 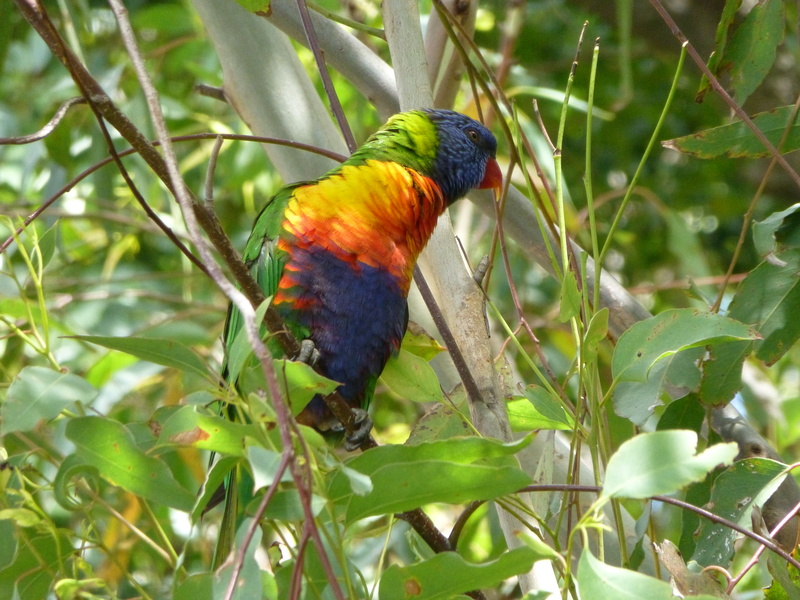 This delightful Rainbow Lorikeet looks so alive and interested in its surroundings. And why wouldn’t it be? With friends galore, he (or she) need never be lonely. With abundant food of the freshest and most natural kind on hand, there’s a potential smorgasbord of healthy delights. Although I see these birds quite often, their beauty and antics will, I’m sure, continue to enchant me. 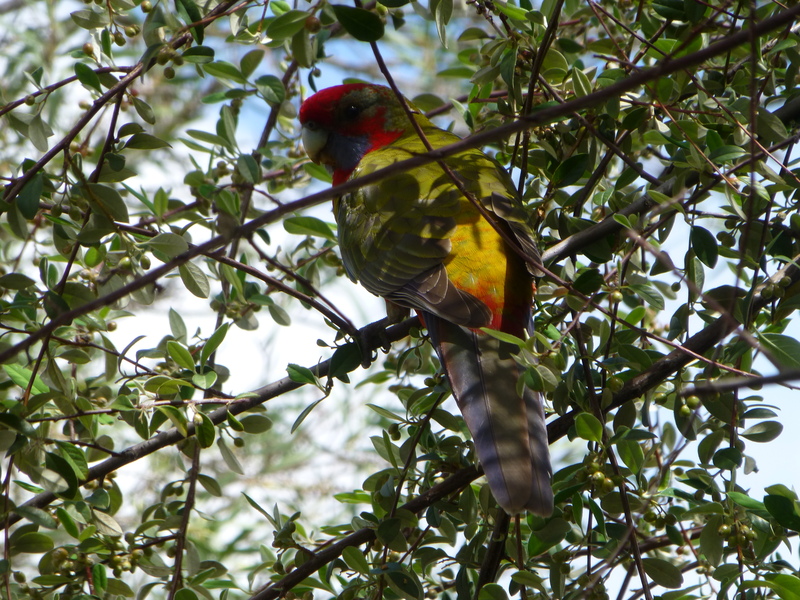 Australia truly is the Land of Parrots! There’s something wonderful about the sight of these magnificent parrots. Their depth of colour in their feathers is extraordinary. Small wonder that they often attract the attention of photographers! Although officially common, I don’t see them every day, or even every week. But doesn’t this make their presence even more special?